Prices | Georgie's Horse Laundry | The 1st Choice for all your equine laundry needs! 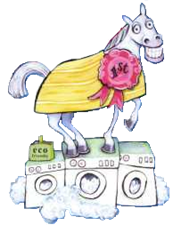 Much more than just washing..
What\'s so special about Georgie\'s Horse Laundry? Wash Only 1 - 20 Rugs 21 - 50 rugs Over 50 ? CALL US. LARGE VOLUME DISCOUNTS APPLY. Please call 07748 184149 during office hours for quote. What's so special about Georgie's Horse Laundry?